BATMAN - It takes more than a maze to baffle the Dark Knight's superior skill of detection. With the help of his high-tech cape's cloaking device, Batman slips easily through the treacherous maze, avoiding and destroying any traps in his path! 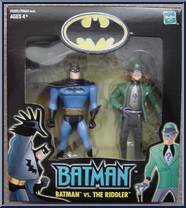 THE RIDDLER - The Riddler is a brilliant criminal obsessed with outsmarting Batman. Now, in hopes of leading the Dark Knight to his downfall, this evil-doer has ensnared Gotham City's downtown in a bewildering maze of motion-sensitive traps! Contribute pictures, update details or suggest corrections for Batman vs. The Riddler. Write a review about Batman vs. 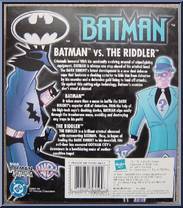 The Riddler.